Posted on Wednesday, October 12th, 2005 at 2:00 am. Subscribe to the comments feed. Both comments and pings are currently closed. Post on your own blog. I’m telling ya, a Nano or maybe a Shuffle (with your face painted as a PLay button) would make a much better costume. That iPod Photo I made was hella wide– I could barely make it through doorways, and the visibility was crap. Let’s hear it for Apple Engineering making slimmer products, which in turn make for slimmer costumes! Although, if I made a video-enabled iPod costume, I’d have to carry a TV around with me everywhere. That’d probably be easier as some wheeled or mechanized costume, really. it’s amazing to see all these people how came up with ipod costumes, but my favorite still has to be the costume I saw last year in the 2004 NYC Halloween Parade. 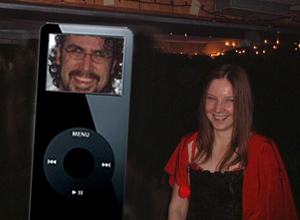 This guy created a iPod Mini costume and it was pretty accurate in scale. He even put up a website to show how he did it. Darn thing looks easy, but I bet it took alot of time….